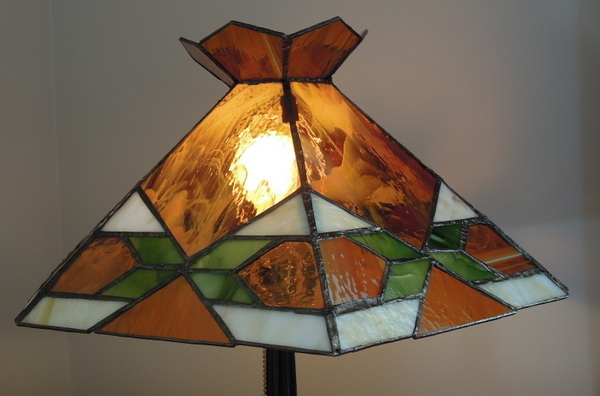 A client who just moved to Central Alberta, unfortunately incurred breakage on a cherished stained glass lamp shade. 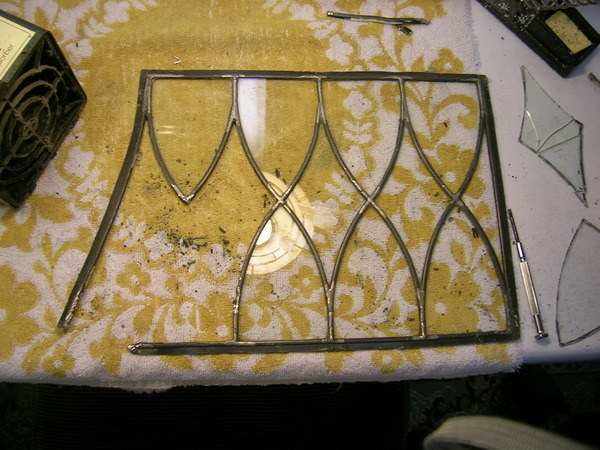 She brought it to us for repair/restoration and this 1st picture shows the broken 2 pieces on the top part of the lamp shade. 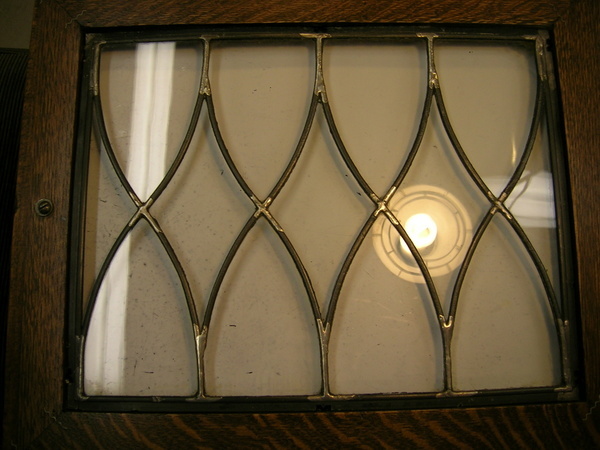 Fortunately for our client we had a few pieces of the same glass which were sufficient in size to replace the 2 broken pieces. 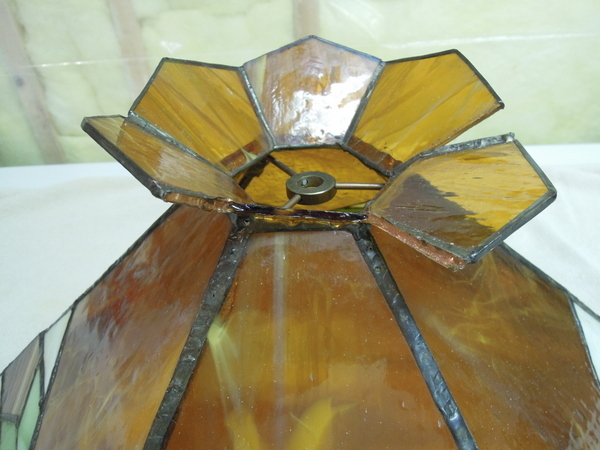 The picture below shows the lamp shade with the new pieces installed, cleaned of flux and ready to have black patina applied to the new solder seams. 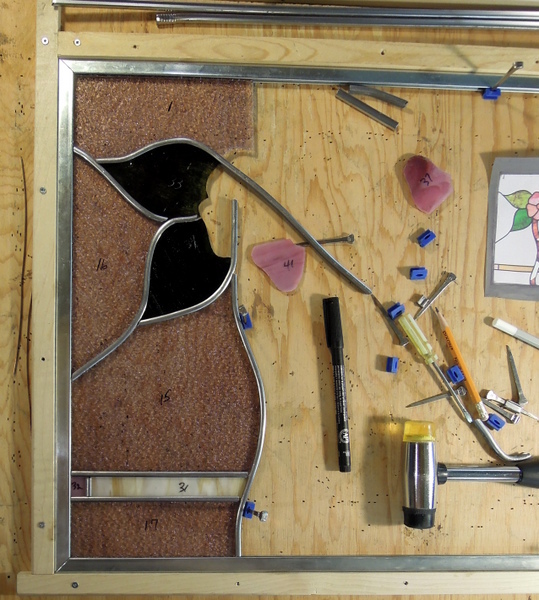 We soldered the new pieces using similar solder lines that the original lamp maker used. 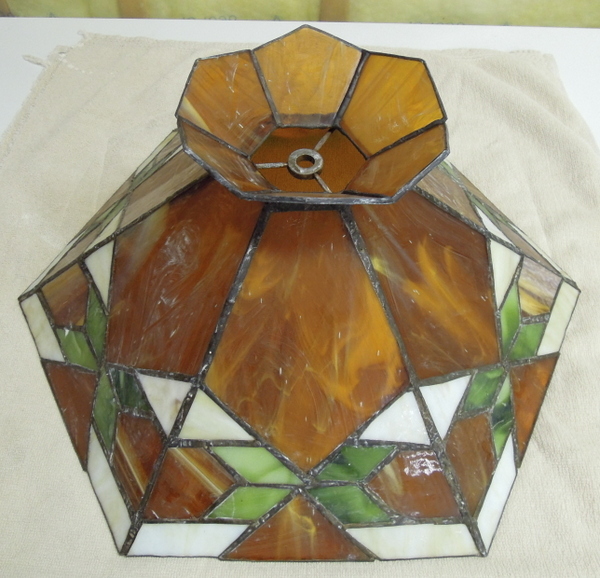 The next picture shows the lamp after having black patina applied to the new solder seams, cleaned with Kwik Clean and now with stained glass polish applied to both inside and outside surfaces. 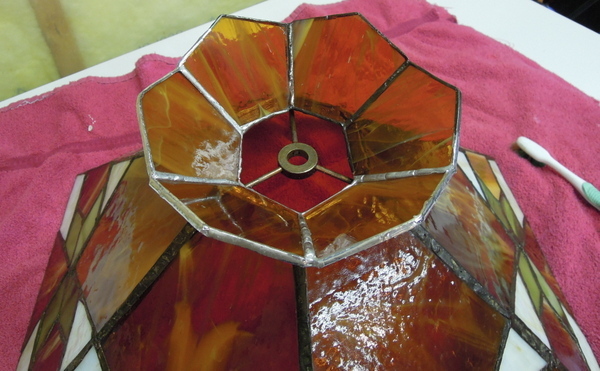 Once the polish dries, we use a soft cloth along with tooth brushes to polish the lamp. After that process we take folded paper towel and go around each solder seam to ensure that each piece in the lamp shade is very clean. The final picture shows the lamp all restored, polished and ready for pick up by our client. 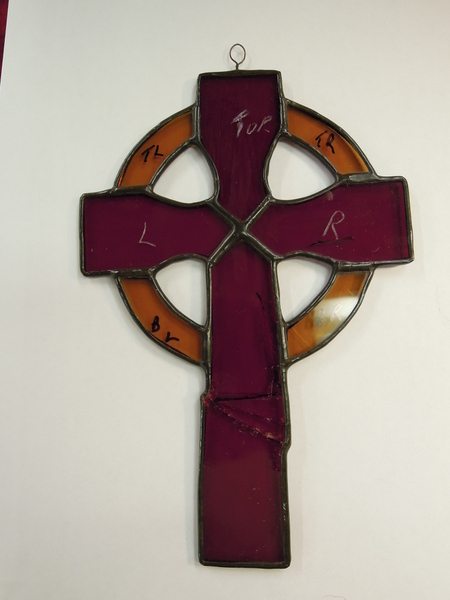 A client who lives in Ottawa purchased this Celtic Cross in Ireland a few years ago. Unfortunately it fell and broke the bottom piece of the cross. The broken glass was a Ruby Red Spectrum Waterglass which we could match. 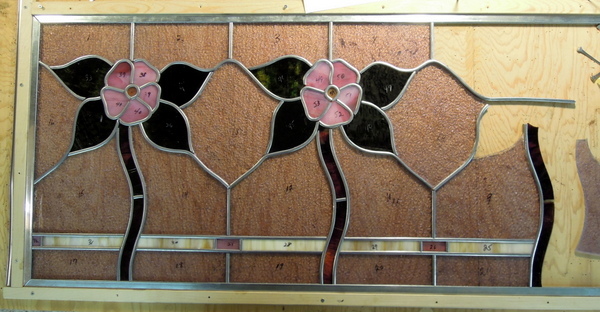 This was a very sentimental stained glass piece, which we were able to restore. 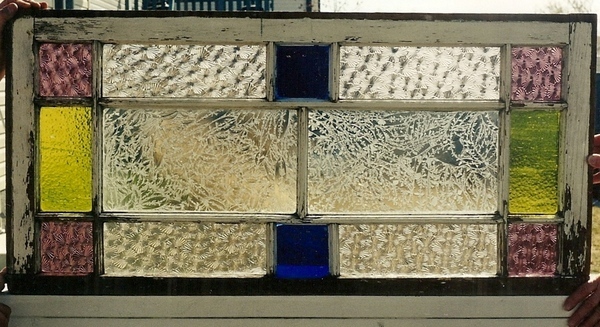 The first picture shows the broken glass. 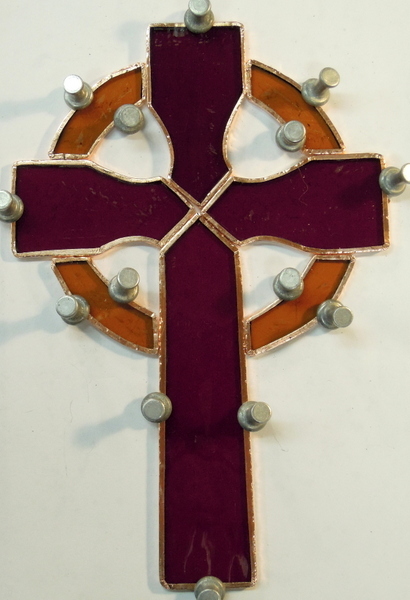 The next picture shows the cross after being totally taken apart, cleaned with burnished black back foil applied and ready for soldering. 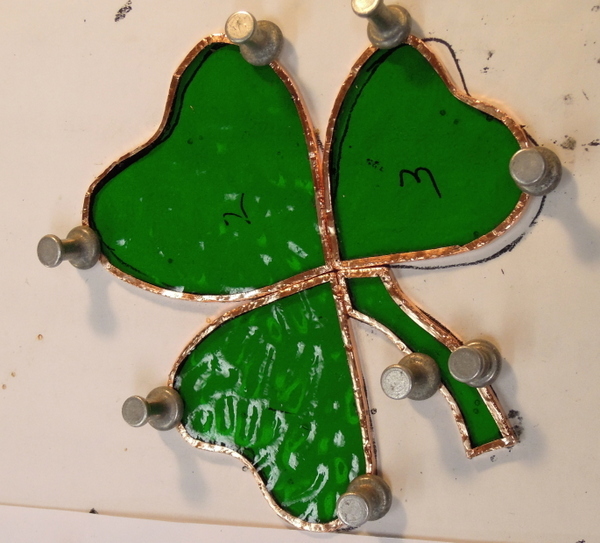 In addition our client wanted a larger shamrock made using Wissmach Emerald Isle glass and the following picture shows it all foiled and ready for soldering. 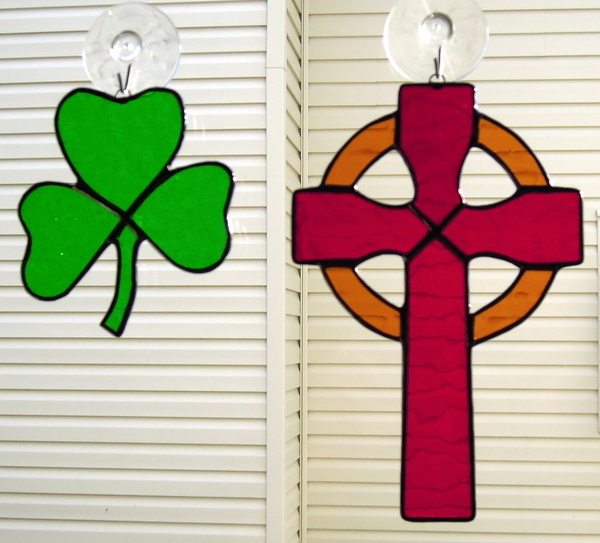 This last picture shows the completed Shamrock and Restored Celtic Cross. 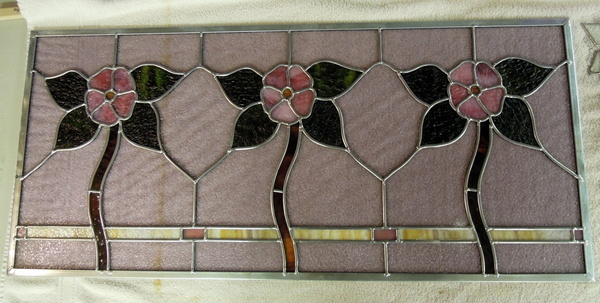 Black patina was used and then a stained glass polish was applied. Then both of these items were shipped to Ottawa Ontario and arrived safe and sound. In 2004 a client brought us this door from a very old china cabinet that came from England. This piece of furniture had survived a fire with the exception of having some of the clear glass broken. The first picture shows the broken condition. 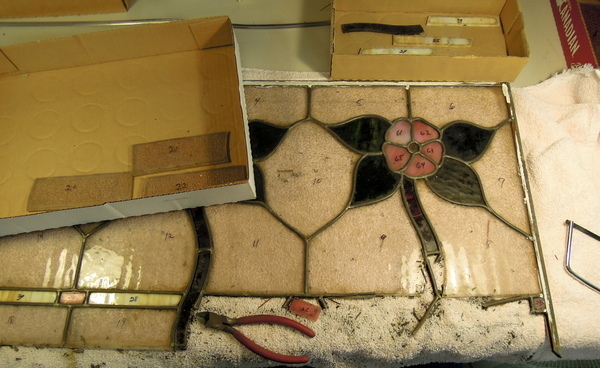 In the next picture we have taken the came unit out of the wooden frame and are replacing the broken glass. 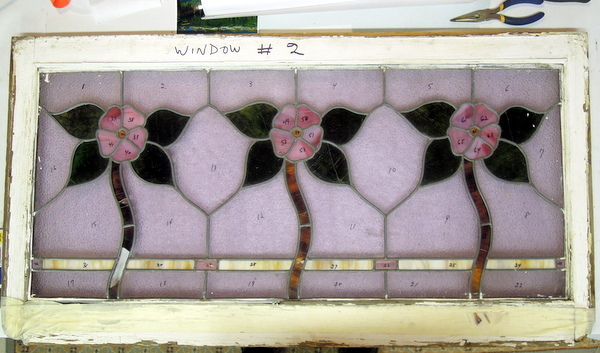 We were able to take the old came lead frame apart and rejoin it, once the new glass was installed. 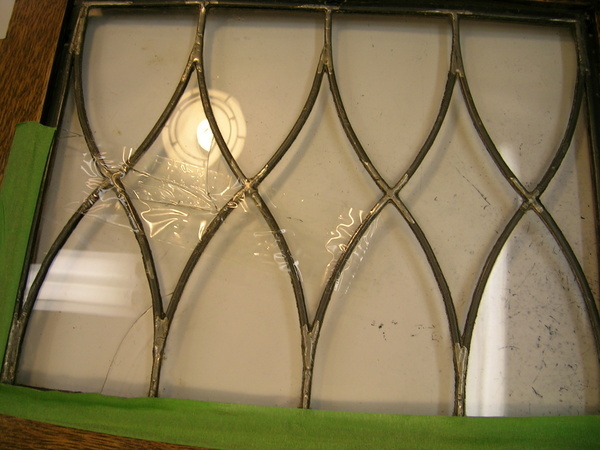 The last picture shows the restored came insert back in the door frame and our clients were most grateful that their beloved old English China Cabinet glass door was repaired.